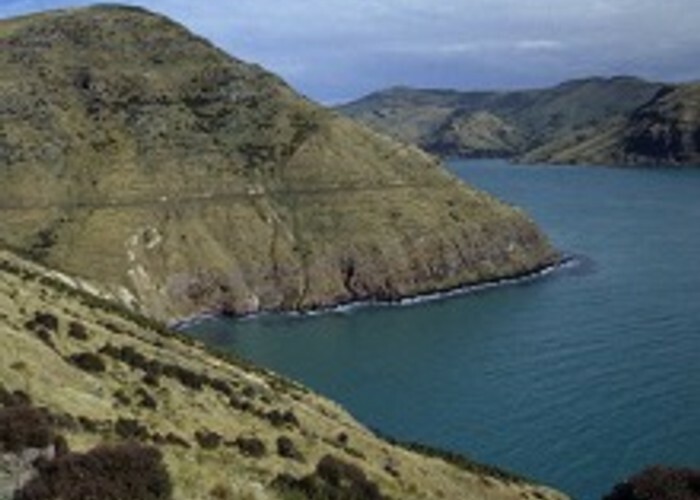 This is a straightforward Banks Peninsula walk following, for most of its length, a vehicle track over private land. Pigeon Bay. • By Matthew. Beginning at the Pigeon Bay Domain, the walkway traverses the length of Pigeon Bay over farm land to Wakaroa Point. A worthwhile walk, it is however less interesting than some of the other headland walks closer to Christchurch (see Scarborough-Taylors Mistake or Godley Head Walkway). The walk is exposed to wind, and there is little shelter from the sun. This walkway crosses private land. It may be closed mid-August to end of September for lambing. The best (sealed road) access to Pigeon Bay is via State Highway 75 through Halswell, Taitapu and Little River. At Hilltop the highway meets the Summit Road before descending into Akaroa Harbour. Turn left onto the Summit Road and follow it a few kilometres to Pigeon Bay Road on the left. This road winds down to the shoreline of the bay 77km from Christchurch. Turn right at the bay and continue past the church and hall into the Pigeon Bay Domain. There are toilets and picnic tables here. You can park here or drive a further 50m past the boat sheds and jetty to the start of the walkway. From a gate the walk follows the water's edge briefly before climbing higher onto golden grassland. There are large spreading bushes of ongaonga at various points along the walkway which should be avoided with care. After 15 minutes the track, marked with orange and white poles, passes through a small grove of eucalyptus before climbing onto a farm track. A sparse grove of stunted manatu (ribbonwood) is crossed a while later, providing the last shade. You may also see titoki and trees of ngaio, while pohuehue is visible smothering its hosts. A variety of butterflies may be seen on the track. Common coppers are the most prevalent: they lay eggs on pohuehue and live for less than ten days. Red and yellow admirals lay on nettles and are present in quantity. White and little grass blue butterflies may also be seen. Eventually the track turns uphill in a zigzag and mounts the crest of the point. Near here the line of poles departs abruptly from the road, crossing a swathe of grasses and dropping toward the cliffs. There are fences around the cliffs in the immediate vicinity of the track end. Looking back toward Christchurch, a series of headlands can be seen including Sumner Head, Godley Head, Beacon Rock and Pigeon Point along with some that are unnamed. Added 1 April 1997 by MatthewMatthew. No revisions. 314 views in the past year (26 per month).